Finance Costs > How Much Does a Credit Card Cost? Although using credit cards too liberally can greatly increase your debt, credit cards can be helpful in many ways. They are safer than carrying cash, more convenient than writing a check, and they allow you to pay bills over the phone or internet rather than having to mail them. Credit cards can also be good in case of emergency, such as a broken down car or sickness. Be careful when using credit cards, however, as it is easy to lose track of what you’re spending. Most credit cards have an interest rate of 8%-19%. This interest rate can be accrued monthly or yearly, depending on the card. The interest rate you get will depend on the type of card, your credit history, how often you use it, and any special offers the company may have. According to thebalance.com, the credit card cost varies based on the credit card and on how you use the card. 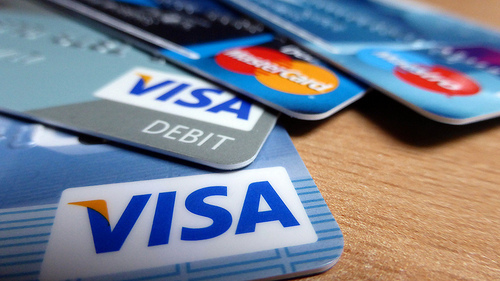 Some credit cards have annual fees that range from $20 to more than $275 per year. The type of card you choose will depend on how often and for what purposes you are planning to use your card. Some credit cards also require a monthly “maintenance fee” of $6-$10. These types of cards also generally have a lower interest rate. This will usually happen with prepaid credit cards. The use of your credit card for any purchases up to a specific credit limit is the main thing included with a credit card. Some credit cards also include certain perks such as airline miles, cash back or discounts on gasoline. If you use your credit card correctly and responsibly, having a credit card can boost your credit score. There is a fee for payments that are received late. Sometimes, this can be a flat rate, usually $25-$50 per late payment, or it can be a percentage, anywhere from 3% to 5% of the total amount owed. Most credit cards have a fee if you spend more than your credit limit allows. There will be an extra charge for a bounced check when paying your bill, usually about $25. Money from your credit card can be given to you in the form of a cash advance for an extra charge. You can transfer the balance of one card to another card (pay off one credit card using another credit card) for a small fee, which is usually around 3%. Take a look at how the credit card is going to be used. Do you want to use the credit card for rewards purposes? Do you just need a card for emergencies? Research the many types of credit cards that include travel, gas, rewards, students, cash back, secured and more. Take a look at the fees that the credit card has to offer. One of the most important fees that you’ll want to look at includes the annual fee. This is a fee that you’re going to have to pay annually regardless of how often you use it. Look into the other fees such as the late fees, over-the-limit fee and miscellaneous fees. The APR is important if you don’t plan on paying your card off in full each and every month. For those that pay their card off in full, you’ll be able to avoid the interest rates that are applied monthly. Try to research your credit score. Your credit score will greatly reflect the type of card that you’re going to be able to get. If you have a lower score, a secured credit card may be a choice. If your credit score is higher, consider a rewards card that can reward you for spending. A credit card can be free if you pay your card off in full and don’t have an annual fee. Be sure to read the pricing details to make sure you understand the fees. Also, always pay your card off on time to avoid a late penalty fee. The better your credit score and spending history, the lower your interest rate will be. Lower interest rates mean less money spent. Paying off your bill before the interest accrues allows you to have the convenience of a credit card without any of the extra charges. If you are only planning on using the credit card in emergencies, then get a card with no rewards program (which means no annual fee) and with the lowest interest rate you can find. Because everyone has a different credit score and spending history, the only way to compare prices is to make phone calls and ask questions. Some credit cards you see advertised or receive “pre-approved” in the mail have many catches in the fine print! If you have a good, long-standing relationship with your bank, sometimes getting a credit card through them is your best option.